For the clients who need smaller size trucks, we can propose 1.5, 3.5 and 6 tons trucks or delivery in a truck as an „additional” load, which can lower the costs. 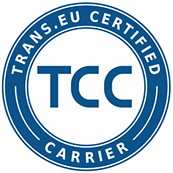 Our trucks meet all the strict technical and ecological standards (european emission standards Euro 5 and 6). Out of conern for the safety of your loads , our insurance policy amounts to 45000 euro. From the very beggining of collecting the load we guarantee GPS and GSM contact with our drivers. At clients' request we can provide two drivers.